In this daily busy life, if you want to send money to someone, then it's indeed a very irritating and time-consuming task. Wait! It's time consuming only for those who don't use Net Banking. Via Net Banking, one can send money to anyone in a very fast manner. Almost every bank provides the Net Banking service. HDFC is one of the best banks in India. When you open a new Savings Account in this esteemed bank, you are provided the Net Banking facility at the same moment. So, if you have HDFC Net Banking service, and want to send money from it to other banks, but don't know how to do it, then this article is nothing less than a boon for you. This article will teach you how to send money from HDFC to other banks via Net Banking. You can send money from HDFC to Punjab National bank, state bank of India, Axis Bank, Union Bank of India, Bank of Baroda and many other banks. In order to transfer money from HDFC to other banks via Net Banking, you must add the intended account as a beneficiary. Here are the steps on how to do so. Step 1: First of all, point your browser to HDFC Net banking site. Step 2: There enter your Customer ID, IPIN (password), and Confirm the Secure Access Image (if applicable). Click Log In. You will be taken to your HDFC Net Banking account. Step 3: Look for the tab that reads 'Funds Transfer' and clicks on it. Step 4: The new page will list out different options for funds transfer. 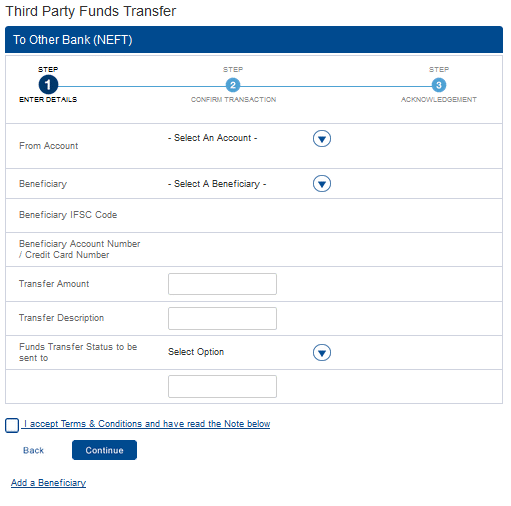 To transfer funds to other banks, choose "Transfer to other banks (NEFT)" as shown in the image below and click the "Go" button. Transfer Within the Bank: If you want to send money to any HDFC Bank, then select this option. 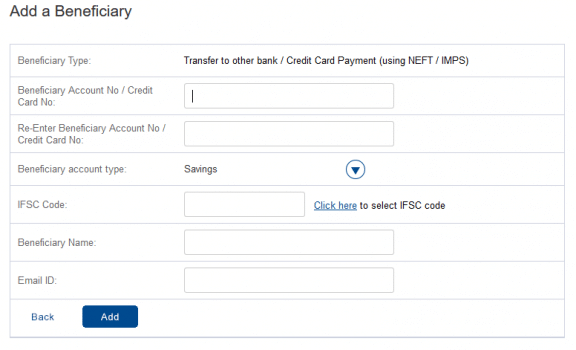 Transfer to other banks/ Credit Card Payment (Using NEFT): If you want to transfer money to any Non-HDFC account or any Credit Card, then select this option. Instant Transfer (Through Account or Mobile No. ): This option is for instant transfers only if the other account has IMPS enabled or Mobile banking enabled on their account. Transfer to other banks (Using RTGS): If you want to transfer fund without any waiting period, then select this option. Select it when you want to transfer anywhere between 2 to 10 Lacs. Transfer to eCMS Account (Virtual Account): If the intended account is the virtual account, then select this option. Step 5: Now if you have already listed the account number, where you wish to transfer funds into your beneficiaries list then you can choose the respective account on the form, add the amount, transfer description and continue. If you haven't listed the beneficiary yet then click "Add a Beneficiary" at the bottom of the form. Step 6: Now again choose the appropriate Transaction Type for the account beneficiary and click "Go". Step 7: Then you will be taken to the page where you are required to provide the details of account which you want to add as beneficiary. Step 8: You are required to provide Beneficiary Account No./Credit Card No., Account Type, Beneficiary Name, IFSC Code and Email ID. Step 9: To enter the IFSC Code, you need to use the 'Click Here to select IFSC Code' option, that will take your IFSC Code Lookup. If you know IFSC Code, then enter it and click 'Search'. If you don't know this, then you can 'Search' by using Bank Name and/or Branch Name. Step 10: On clicking the 'Search', you need to select your bank from search results. Step 11: So, once you have filled all details on 'Add a Beneficiary Page', just click on 'Add' and then again 'confirm' the same details. Step 12: For Security purposes, you will be sent 'One Time Password or OTP' to your registered mobile number. Enter this OTP in the field asking for it and click 'continue'. Step 13: You have successfully added Beneficiary. It will take 12-24 hours for this just added the beneficiary account to get activated. Then only you will be able to transfer money to it. 1. Login to your HDFC Net Banking account and head over to 'Funds Transfer'. 2. Now choose the appropriate transaction type. 3. Select Transaction Type and click on 'Go'. 4. Select the Account from where you want to transfer the fund, Select the Beneficiary to which you want to send the money. Enter the Transfer Amount figure and description. 5. Select where you want the fund transfer status to be sent - Mobile or Email. Click on the checkbox to confirm that you agree to Terms & Conditions. 7. Verify the details on the next page. Once you are done with verifying them, click 'Confirm'. 8. The NEFT Fund Transfer will be initiated. It's better to print this page or take the screenshot. 1. If the beneficiary you added has not been activated yet, then you will not be able to transfer fund to that. It usually takes 12 to 24 hours for successful activation of a new beneficiary. You can check the status of an added beneficiary by heading over to 'Third Party Transfer' tab and then clicking on "View list of Beneficiaries". The status of the intended beneficiary must be shown as 'Enabled'. If not so, then wait for it to get enabled. 2. Always provide a meaningful 'Transfer Description'. It will help you to keep track of your hard-earned money. 3. Take the printout of 'Fund Transfer Initiated Page' or take its screenshot at the very least. 4. After adding a beneficiary and initiating the fund transfer, it takes around 3-4 hours or less/more for a fund to appear in the recipient account. So be patient! That's it. This is how you can send money from HDFC to other banks via Net Banking. Hit the comment box if you need any further help in this aspect. HDFC is slightly more complicated than other banks like icici or axis. i touch the click here option but that not open so what can i do? Well why do we need this much details. While filling up the benificiary information. Hello I have been using the net banking app and it works just fine for me however, my brother recently got his customer id and password and was able to log into net banking but is not able to add a beneficiary or make any transactions. The error is 'application transaction is not allowed' please advise urgently. Just want to check while adding the beneficiary is it mandatory to add the email id? What if the beneficiary does not have an email ID and also his account is not net banking enabled, can I still send the money using neft ? Yes preeti you can send money to any account..
i followed ur steps then to not able to transfer money. i can not understand why i could not transfer money??? hey,the article was completely useful please tell me whose mobile/email is to be put while "fund transfer status to be sent to" while doing TPT using NEFT,Is it either beneficiary or the account holder itself? I transferred 50 k To another bank account on 9 march of 2016. but its still not credited, but money is taken from my side. what to do? it will take how much time to transfer the money to that account.If some kind of emergency. don't do money transfer to other bank account holders. its take too much of time to transfer. Its any time limit to transfer from one bank account to other bank account holders. please help me for this questions? its should be transferred with in 24 hours. Today I have transfer the money from my sbi account to hdfc credit card, how much time it will take. Reply fast. I want to know, if i use to transfer big amounts frequently via NEFT to different people then is there any taxes i will have to pay in future..?? tax paid on incoming money. Hi, is there any option for scheduled NEFT transfer from HDFC account to other account every month? icici net banking is better than HDFC BANK icici do not take more time in fund transfer. i added a beneficiary and tried to make a neft transfer the same day the beneficiary was activated. The transaction didn't go thro'. Why? how long one has t wait to make the transfer? For NEFT transactions, one needs to feed a fifteen digit account number. I had typed only a 4 digit number.I then contacted the concerned bank and noted the 15 digit number. I again tried to transfer money online,but the amount was redeposited into my HDFC bank.I want to know whether a beneficiary can be cancelled. I want to schedule the transaction so that on every 5th of month a fixed amount is transferred to my beneficiary account. How to do that? i have transferred money from hdfc to sbi amount deducted from my account but not credited in my sbi account.how much time it take. i have transferred on Saturday. Your description of how to carry out transfer of funds from an HDFC ac to a beneficiary ac in another bank is lucid & easy to understand for a layman. Thanks, written with lot of thought & interest. However, why is it that I am not able to see the tab "Third Party Transfer" on the top of the netbanking page of my HDFC account? How do i set a standing instruction to debit a certain amount to another (non-hdfc) savings account automatically every month? I am not getting this info anywhere, please help. It is not a bill payment, but automatic funds transfer to another savings account. i made a transaction through netbanking NEFT but in the space of beneficiary a/c no. by mistake i wrote the payee a/c no...now what should i do to get back my amount? Can i transfer small funds like 10-15k from my salary hdfc account to my pnb savings account? Yes, you can send money without any issue. IN HDFC TO OTHER BANK TRANSFER THROUGH BY NEFT HOW MANY TIME TO TAKE DEPOSIT IN BENEFICIARY ACCOUNT ? Hi, I have already added a beneficiary. Now when I am transferring money it is asking for an email/mobile number for communication. I wish to know if I can put any email id/mobile number where ever I wish to send the status or I must put my email id/mobile number only or I must put the beneficiary's email id / mobile number only. Hi team I want to transfer money from hdfc to indusind bank so when I try to add beneficiary its says er(cannot read property 'Mid Appld'of null please tell me how to resolve. hello , i use net banking first time please demo how can transfer amount hdfc to another account. Hi Team, I have done IMPS Transfer from HDFC to other bank account.Amount got debited from my account .But it was not transferred to beneficiary account. After 10 mins i got SMS that the IMPS transaction is timed out. How should i proceed further to get quick resolution on this. They will refund your money If not sent..
hi am having hdfc bank net banking i want to transfer money to sbi credit card its asking IFSC code what i have to enter. I have added benefitiary ( my sister ) just 20 mins back but unable to view her name under 'view benifitiary list' . can someone tel me how long will it take to reflect their name in the system ? in HDFC net banking "add a beneficiary " page, whose email id is to be added?the beneficiary's or the HDFC account holder's? Kindly help. can anyone please let me know the direct link where I can log into the net banking and so that I can add a beneficiary accounts? I am trying so many times..but it is showing like this facility is not available currently.. it will be great if any one could help me with this..
You can use both IMPS or NEFT transfer options for transferring funds to another bank account. 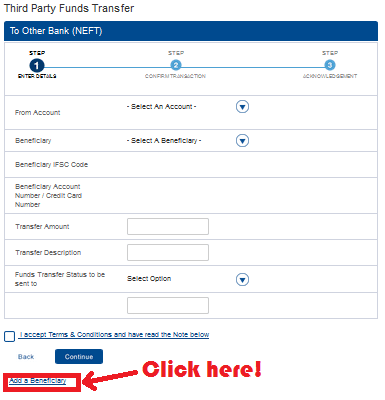 When you select IMPS or NEFT, you will find a link "Add a Beneficiary" below the form. Click the link and you can add the beneficiary. You may not find the "Add a Beneficiary" link on "Transfer Within Bank" page. So choose, NEFT or IMPS funds transfer option to add a beneficiary. Hi, My brother transferred money to hdfc account from SBI Netbanking, but i am not using that hdfc account for 2years,what happens? plz help me out. Don't worry, Just contact your branch. Check money is transferred or not. If not, It will be refunded to your brother account. Thanks so much.....very useful and explained in very understandable manner for a layman. can I transfer some money to china ? You can't transfer money to China from your bank. You can use Western Union Money Transfer or PayPal for transferring funds from India to China. If you are an NRI then you can also use NRI banking services to transfer funds through banks. Where can i see the transfer history in the Internet banking site?? Is there any place where i can see the transfer status as well?? You can't check the transfer status from your internet banking account but the fact is that the funds transfer is instant and the banks guarantee for successful transfer within 24 to 48 hours for NEFT transfers. You can check your transfer history through your account statement that you can generate from your internet banking account. what is the service tax on transfer of amount of es 10000 from icici bank to hdfc bank. They will just deduct little transfer charge. Did you installed any new addon recently, disable it and try. I'm having the same problem -- on all browsers. After HDFC revamped their site, the third-party transfer isn't available. Clicking "transfer within the bank," for example, takes you to the help / main page. In fact, all the Funds Transfer links take you to a Help page. This happened around Jan 15, 2015.
i having salary account in HDFC... can i transfer money in Net banking to icici bank account on non working days. Yes you can transfer, but it would be approved on working days. please can anyone tell me what are the additional charges for tranferring money from hdfc bank to sbi bank..? I have a doubt, If sender transfers fund to other person's account, added this persons contact number in mobile/email text area before clicking 'Continue' then Can This Person see sender's cleared balance in account after transfered fund ? If that mobile number is activated with receiver bank account, then he/she will get notification. How much time it will take to transfer amount to my other account?? It may be possible to transfer money atm to other account. Otherwise you can send money from bank directly. I have made an incorrect fund transfer who was already added to my beneficiary account. I wanted to know how do i go about cancelling/blocking the transaction or any other way to get the money back. Once payment sent, there are no any ways to stop or revert the money. Tell him to send back your money. What is the maximum time taken to transfer money from hdfc bank to corp bank. Can be transferred within 24 hours on working days. plz conform Which ifsc code i should enter whether Hdfc or SBI? You need to enter IFSE code of that bank where you want to send money. Arpana, thanks for positive feedback. Mohit it is not possible to cancel the payment, once you made the payment..
For transferring money from HDFC to Punjab National Bank, What is the website? Do you have internet banking? If yes, visit https://netbanking.hdfcbank.com/netbanking/.... Otherwise, visit your bank to get net banking or transfer money directly to pnb bank. yes you can send money to any banks at any part of India. Thanks.Its really nice post. 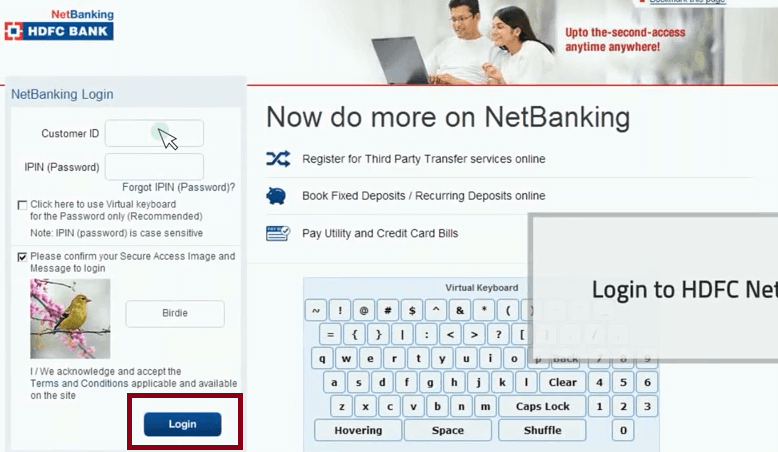 Its very helpful for new netbanking user. Glad to hear nice feedback from your side. I need to transfer money to SBT NRI account holder, can anybody help me out? ICICI NET BANKING IS BETTER THAN THIS. NO NEED OF TIME TO ACTIVATING A BENIFICIARY,IT WILL ACTIVATED ON THAT SECOND WHN WE ADD A NEW BENIFICIARY.. Very nice and very useful. I have transfer money from HDFC to sbi bank by using your instructions. how much time does neft sbi takes? Thanks for useful post. I have transferred money from hdfc to sbi bank. i am not able to find the list of hdfc bank ifsc code please help metolocate.